The drive from Jodhpur to Jaipur took a very, very long time. We checked in to Hotel Madhuban at 4pm. This hotel is owned by and used to be home to some descendents of ancient rulers of Patan in Rajasthan. The hotel is decorated with fine antique furniture and elaborate royalty costumes and silverware in display cases. It has an outdoor restaurant area and even comes with a pool, which we didn’t use but attempted to. 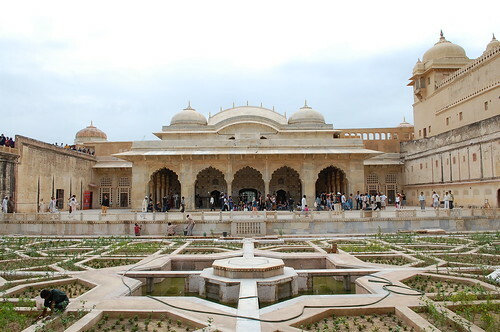 We visited the Jaipur City Palace but were not too impressed. I think all in all, we spent about 20 minutes in the palace. Since we were in the car for pretty much the whole day, we wanted to walk to our next destination. The surrounding streets and market by the palace were a bit um, filthy. If Delhi perpetually stank of pee, Jaipur perpetually stank of dung. I was playing with my D40 when I noticed some boys running towards me. They were running because a cow was chasing them, which means the cow was heading straight at me. I of course freaked out and ran with them. When I thought it was safe to stop, I turned around and of course the whole street was laughing, including the three Malaysians traveling with me. 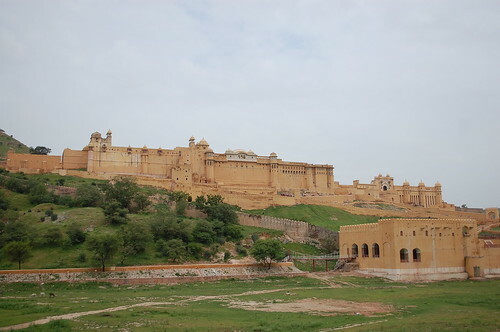 Next morning, we checked-out from the hotel and went straight to Amber Fort. I thought I had seen enough forts by then but this fort was quite stunning. You are not allowed to drive up to the fort, so there was a bit of hike. Alternatively, you could pay for an elephant ride. Oh, and you know how I got chased by a cow at the market, well Merv got chased by a donkey at the fort. We took the wrong turn and went on the elephant path. On our way to Agra, we stopped by Fetehpur Sikri. We didn't make it into Sikri but did Fetehpur. 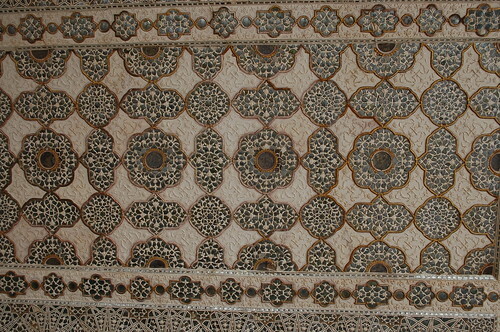 Some beautiful motifs on the walls. A garden in the fort. You also forgot to mention that we had our first time experience buying train tickets at the train station. A rather chaotic process, with people constantly peeking behind our shoulders, and a very complex train system with a zillion inputs in a DOS system interface. I thought it was quite exciting. I didn't forget lah - I was sick as a dog and bedridden in the hotel room and waited a few hours for you to come back with some very strong medications.